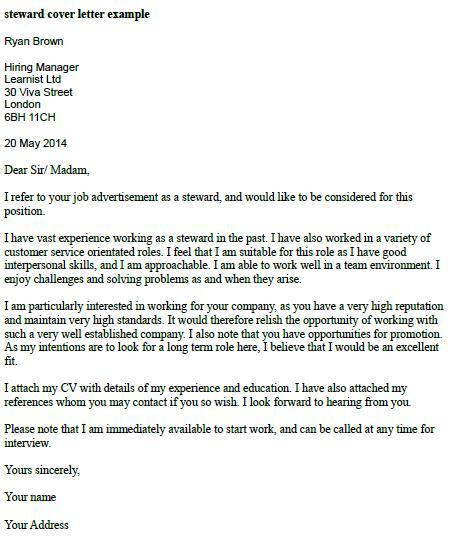 Steward cover letter example for you to amend and apply for latest Steward job vacancies. I refer to your job advertisement as a steward, and would like to be considered for this position. I have vast experience working as a steward in the past. 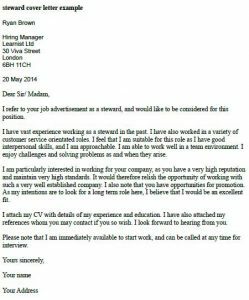 I have also worked in a variety of customer service orientated roles. I feel that I am suitable for this role as I have good interpersonal skills, and I am approachable. I am able to work well in a team environment. I enjoy challenges and solving problems as and when they arise. I am particularly interested in working for your company, as you have a very high reputation and maintain very high standards. It would therefore relish the opportunity of working with such a very well established company. I also note that you have opportunities for promotion. As my intentions are to look for a long term role here, I believe that I would be an excellent fit. I attach my CV with details of my experience and education. I have also attached my references whom you may contact if you so wish. I look forward to hearing from you. Please note that I am immediately available to start work, and can be called at any time for interview.